Child rights: imprisonment for maintenance defaulters? Child support is a child’s right, and the premise of the maintenance regime in this regard is to protect the child. 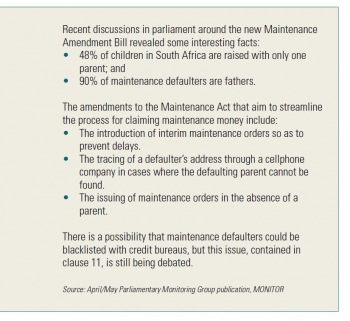 The current South African maintenance system is flawed, says Isabel Magaya, who reviews the criminal sanctions proposed in the new Maintenance Amendment Bill (2014) to ensure that child maintenance obligations are met. Women in South Africa have great difficulty in obtaining support from those legally obliged to provide maintenance to them or their children. The blatant disregard of maintenance orders results in great hardships for these women and children. Therefore, how the maintenance system deals with recalcitrant defaulters is an important mechanism for endorsing children’s rights and ensuring maintenance obligations are met. Non-payment of maintenance is a children’s rights issue. The South African maintenance system is flawed. Women and children battle to exercise their right to maintenance and to enforce these rights in terms of the Maintenance Act. Non-payment of maintenance is a children’s rights issue. Section 28(1) of the constitution provides that ‘every child has a right to be protected from neglect’ and Section 28(2) states that ‘the best interests of the child are of paramount importance in every matter concerning the child’. Hence maintenance obligations towards children should be regarded as a primary obligation, because the money is for immediate personal needs and is therefore life sustaining and relied upon for survival. Due to the plight of many women and children, the legislature found it necessary to tighten the noose on recalcitrant maintenance defaulters, as evidenced by the harsh criminal sanctions proposed in the Maintenance Amendment Bill (2014). The bill proposes to increase the penalty for failure to pay maintenance from a maximum of one year in prison to three years. argue these lengthy prison sentences are counterproductive in that they kill the so-called goose that lays the golden egg. 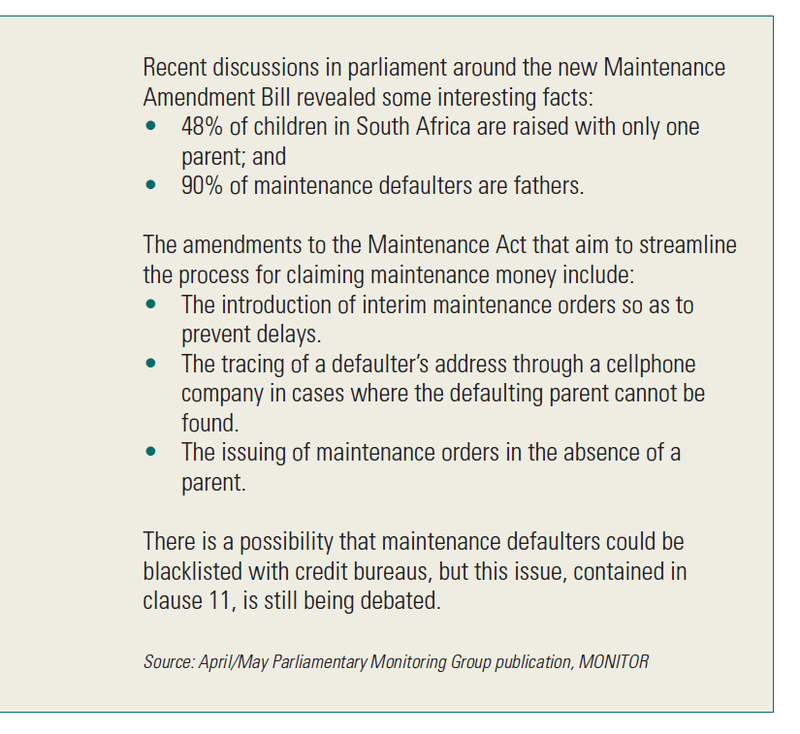 The maintenance defaulter’s future earning capacity is also jeopardised together with the child’s right to claim maintenance. A historical look at the maintenance regime’s criminal sanctions is instructive. Criminal sanctions against maintenance defaulters have been in existence since 1935. Even then the imprisonment of maintenance defaulters was thought to be counterproductive and did nothing to improve the position of maintenance claimants. Several of the acts that followed continued to make failure to comply with a maintenance order an offence, including the current Maintenance Act. The existence of these criminal sanctions since the 1930s is indicative of maintenance enforcement difficulties, and frustrations with the evasion of payment of maintenance claims by maintenance debtors. Mamashela notes that the development of maintenance law in each successive act sought to improve the mechanisms for holding maintenance defaulters accountable. It is interesting that even though these criminal sanctions have been in existence since 1935, presiding officers have been cautious in sentencing defaulters to imprisonment. Prison sentences have almost always been suspended sentences; no one has ever been jailed for not complying with a maintenance order. It seems that there is an imbalance in protecting children’s rights and the rights of defaulters. According to South Africa’s constitutional imperatives and international law obligations, the best interests of the child are of paramount importance in every matter concerning the child. However, this does not seem to be the case in the maintenance system. There are high rates of failure by maintenance debtors in complying with their maintenance obligations. Maintenance defaulters appear to be safeguarded under the guise of protecting the goose that lays the golden egg, but what good does it do to protect a goose whose golden egg one never benefits from? A review of court judgments reveals courts are not using the available sentencing options optimally. Courts are continually suspending sentences and not using more effective sentences for recalcitrant maintenance defaulters. The issue is a contentious one. Lengthy prison sentences do not benefit the maintenance debtor or the child in the long run. Apart from maintenance, parents have other roles they play in children’s lives. The importance of having a parent in a child’s life cannot be gainsaid. As we look for solutions to these problems, we should not downplay the emotional and psychosocial role played by fathers. The law should not illustrate the role of fathers only as providers, but should also signify their presence and contribution in other ways. of society thereby needing better protection from the legal system as they are unable to participate in human rights discourse. A critical issue centres on family support and how best the law can support the family institution in maintaining its children and ensuring that children are not prejudiced in anyway. The problem is how to deal with recalcitrant maintenance defaulters who abuse their financial power and disadvantage their children in law and policy, and translate these into feasible solutions in practice. Children need innovative maintenance enforcement methods that have a positive effect on their lives in the short and the long run. What we need is a practical and holistic solution to the debilitating problem of recalcitrant maintenance defaulters. We are looking for solutions that strengthen existing enforcement processes while remaining cognisant of the children’s best interests. Looking at the proposal to increase the prison sentence from one to three years one has to ask, will this effectively resolve problems experienced by users of the maintenance system? What we are looking for are solutions that can strengthen existing enforcement processes while remaining cognisant of the children’s best interests. Criminal sanctions in the past did little to ensure that those who claimed maintenance benefits were assisted or actually benefited. There is no guarantee for women who claim maintenance for their children that the maintenance claim will be paid. Criminal sanctions are supposed to have a deterrent effect, but since 1935 they have gradually been losing that effect. Whether this proposed increase in the prison sentence will actually yield the desired outcome for children remains to be seen.